Printing involves localized coloration. This is usually achieved by applying thickened pastes containing dyes or pigments into a fabric surface according to a given color design. In particular, the viscosity of a print paste is critical. It determines the volume of paste transferred to the fabric and the degree to which it spreads on and into the surface yarn. The paste must color all the visible fiber on the printed surface, so it must penetrate somewhat into the yarn structure. If the paste is too “thin”, it will spread; giving poor print definition, and penetrate too far into the yarns decreasing the color yield. The unfinished and un-dyed fabric is termed as grey fabric. The process is applied to remove dust, dirt, small fibers and other additional substances by brush before singeing. Shearing is done to cut out extra warp or weft end from the fabric surface. It is a process by which the floating or projecting fibers stands out on the fabric surface are burnt off is known as singeing. De-sizing process is applied to remove the sizing material from the fabric. This process is applied to remove the oil, fats and waxy substance and also added other impurities by certain percent of alkali and which increases the absorbency power of the textile materials. The main object of bleaching process is to remove natural color of a fiber and make the textile materials pure white and bright. Mercerizing is the process in which the cotton materials are passed with 20-22% NaOH or 55-60% Tw (Towdel) concentrated of NaOH for 2-3 minutes at room temperature. The process by which we can keep the proper width of fabric in length and widthwise and increases the smoothness, lusternss, evenness of fabric is termed as stentering. Washing process is applied to wash the textile materials. The textile material is dried after completing washing process. The process of transferring of yarns from ring bobbin, hank etc. into a suitable package is termed as winding. It may be electrical or mechanical. To wind the dried fabric on beam is termed as beaming. After completing all the above processes, printing process is applied here. Finishing process is applied to provide the proper quality of textile materials at the end of the textile processing, which depends on the customers. 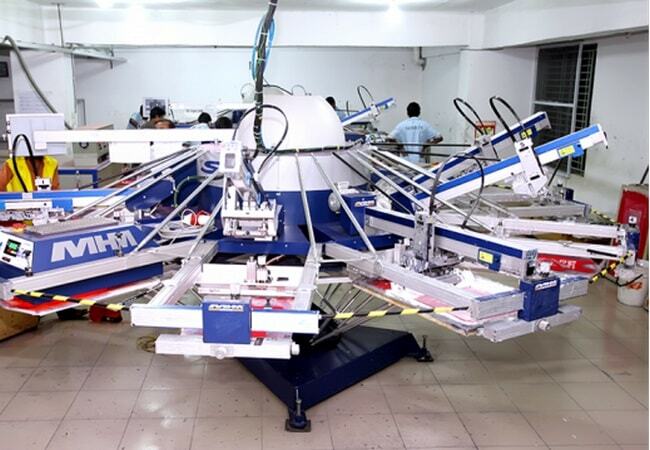 How to Apply Printing Application in Textile Industry? Printing was originally done by hand using wooden blocks with a raised printing surface, much as children do potato printing. The two main techniques used for transferring paste onto fabrics involve engraved rollers carrying paste in the recesses corresponding to the color pattern, or screens with the open mesh in the pattern areas. There will be one roller or screen contacting the fabric surface of r each color to be printed. Pigment and dye printing are both direct printing methods. Two other important indirect printing methods called discharge and resist printing also give colored designs. In case of discharge printing, a uniformly dyed fabric is printed with a paste containing chemicals that destroy the color leaving a white pattern. If the paste contains other dyes, stable to the chemical that discharges the ground color, they can dye the treated area. In this way, multi-color effects are also possible. In case of resist printing, the fabric is dyed after printing. The printed areas resist dye absorption so that these design area are reserved. After removal of the resist agent, the design may be white or colored if other dyes and appropriate chemicals were present in the original paste.